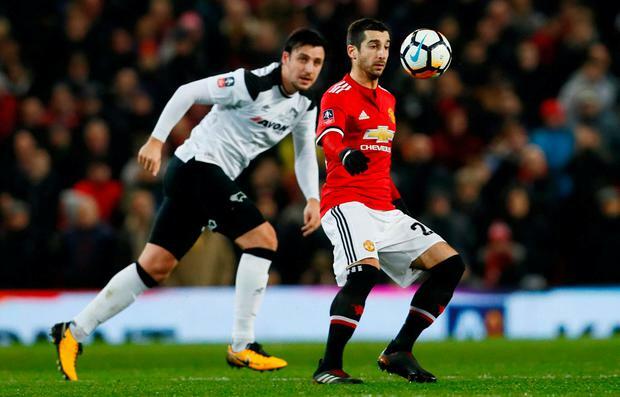 Henrikh Mkhitaryan received an apology from Jose Mourinho having been taken off at half-time against Derby, the Manchester United manager has revealed. The Armenian's latest opportunity to impress lasted just 45 minutes as Mourinho hooked the midfielder for Romelu Lukaku following a goalless opening half where Mkhitaryan looked bereft of confidence. At one point he sailed a cross way over its intended target and also misplaced a simple pass to groans from around Old Trafford. Mkhitaryan has not scored for United since September and has completed 90 minutes just twice all season, yet Mourinho was apologetic when explaining his half-time withdrawal in a game his side went on to win 2-0. "(It was) unfair. Unfair," he said. "And I told that at half-time. I didn't like what I did. Unfair. He didn't deserve it. "He was playing well, he was not playing bad. He had a couple of missed possessions but he was playing well, he was giving (a) good dynamic to the team. "My feeling was just that (Marcus) Rashford is not going to score a goal. In the moment he's not going to score a goal. And because of that I'm not going to lose time and I'm going to play Romelu. "And then I had to sacrifice a player and it was Micki the one that I sacrificed. "But it's something that I normally don't do. I did at half-time. I apologised to him in front of the people because he didn't deserve (it)." Mourinho's belief that it was not going to be Rashford's night came after the forward missed three good first-half opportunities, including one free header he glanced onto the post from six yards out. The 20-year-old, who started as a central striker, moved to the flanks after Lukaku's arrival but was denied by the woodwork again as his goal drought extended to an eighth game. His dip in form has coincided with Jesse Lingard's purple patch and it was his latest wonder strike, his eighth goal in 10 games, that finally broke Derby's resistance in the 84th minute. "He's in this moment where things go well for him," Mourinho said of Lingard. "He's the opposite of Marcus. Marcus is in training and scores unbelievable goals. He's coming to matches and he's missing unbelievable chances. He hits the post and the goalkeeper saves. "Clearly the players have these moments. I'm not worried with Marcus because the good moments will arrive and Jesse, if the negative moment arrives, I don't think he will lose this stability that he's showing." There was no sign of Lingard's confidence wavering on Friday night when he beat Scott Carson with a swerving half volley that even Derby boss Gary Rowett could not help but admire. "It was an unbelievable strike and that was probably what it was going to take," Rowett told RamsTV. "Lingard just took a touch, we couldn't get close enough to it, and he's just spanked it in from 30 yards into the top corner. "It was a fitting way to win the game certainly. I think I stood and applauded for about 10 seconds."